Transportation manager, or in other words: over a decade, driver for “Neverne Bebe”. 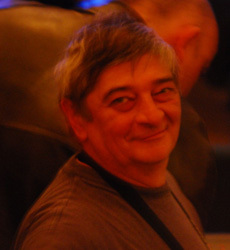 Born: May 19th, 1951 in Belgrade. Education: Graduated High School (Gimnazija) and graduated DIF (Physical Science Faculty) in Belgrade. Marital Status: Married. Father of two sons. Worked two years as a professional water-skiing coach in a permanent position at Nautical Club “Zemun”. Worked as a main operator on a big computer system in “Progres” in Belgrade. For many years, he owned a workshop for building and repairs of fiberglass boats. For 11 years, he was working as a transportation manager and a technical assistant for CBS News in the former Yugoslavia. Director of International and Domestic Trade Company “AS Line” in Belgrade. Sports Director of water-skiing club “Jezero”. Graduated Elementary School of Music (keyboard accordion). In his school days, he played keyboards for two years and a bass guitar for another two years at VIS “Simptomi”. He undertook transportation responsibilities for famous music groups such as “Di Luna Blues Band”, “Sirova Koza”, “Bajaga”, Van Gogh”, Riblja Corba”,“HAS”, “Generacija 5”and many other Jazz, Blues, & Rock groups. Since April 1995, he has been a permanent member of “Neverne Bebe” team, driver of the band and their equipment. In 12 years, with 1200 trips and concerts, together they’ve travelled around 300 000 km and this number gets higher and higher each week.